Many people often opt to get a new Tattoo but regret the decision later on in life, at Aesthetics of Liverpool we are able to offer Tattoo Removal using effective Laser Treatment. Whilst Tattoos where once considered a permanent feature on the body it has now become possible to remove them, either fully or partially. A recent study showed 1 in 7 people who have a tattoo regret getting one. Whilst a lot of people have no regrets many clients often regret their choice of design, where too young when they made the initial decision,or simply just don’t like it anymore. Fortunately Laser Tattoo removal is now available and with a course of treatment can remove the design completely. Results and the number of treatments needed varies from client to client, on average a course of 6-10 treatments is enough to remove the Tattoo. Laser Tattoo Removal first became popular in the 1990’s and is now highly sought after treatment. The procedure works by passing a short pulse of high power laser light through the skin, the light works to shatter the tattoo ink particles. These particles are usually to big for the bodies immune system to break down naturally, however Laser Therapy breaks them into smaller particles allowing the body to dispose of them naturally. Again treatment time will vary from client to client, each session can last between 5-40 minutes but is dependent on the size of tattoo. The procedure can be slightly uncomfortable and cause a stinging sensation. Though a Local Anaesthetic can be applied to reduce this. Certain parts of the body can be more sensitive to others such as the ankles, or elbows. 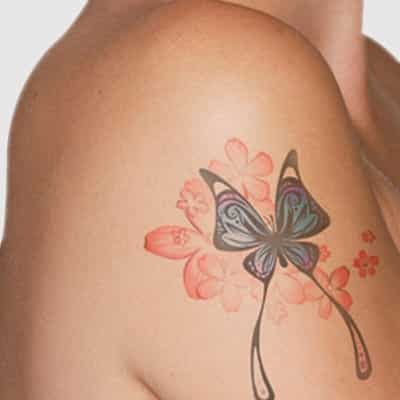 However with each treatment the Tattoo will fade and the discomfort felt will also reduce. A stinging or burning sensation through the procedure. A feel if heat during the procedure, the treated are with continue to feel hot for some time after treatment. During treatments most patients will experience small white dots which appear on the the skin for several minutes after each laser has been applied. Post Treatment minor bleeding may occur , the skin may be red and swelling may be visible, and skin will feel tender to touch, this usually subsides after a few days. Oozing and Blistering is also common,once they have healed the skin over the Tattoo will look shiny for a number of weeks. 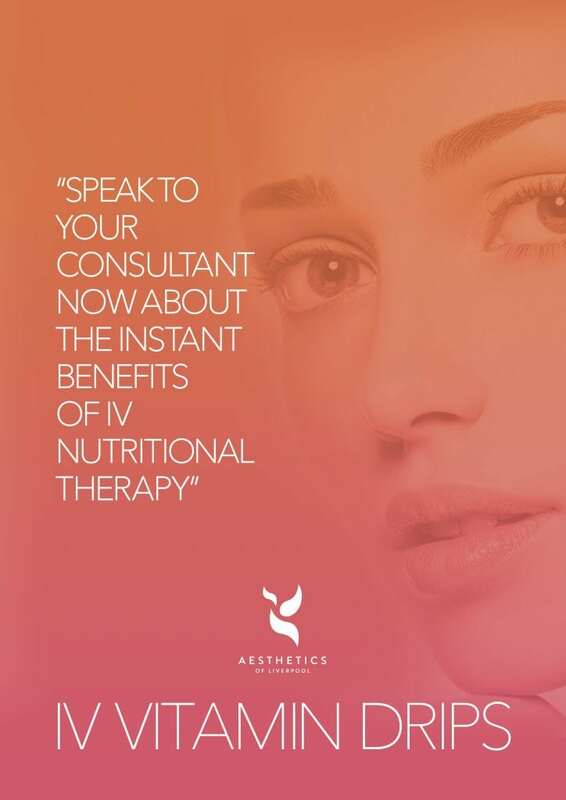 It is vital that skin is well cared for post treatment. The treated area needs to be considered as a minor burn, it should not be picked at, and blisters should not be popped. There is risk of infection if the treatment area is not properly cleaned and looked after. Hyper-pigmentation (patches of darkened skin) in particular on people with darker skin types. This condition usually resolves of its own accord though your practitioner can recommend appropriate products to even out disrupted skin tone. Hypo-pigmentation (patches of pale colour loss). The Laser Treatment will be targeting the colour of the Tattoo Ink however it can also effect the natural skin pigment or melanin. This can leave the treated area appearing somewhat ‘bleached’. Skin may recover, but this process can take months, sometimes even years and may never match exactly with the surrounding area. The risk of this happening is increased with darker skin tones. 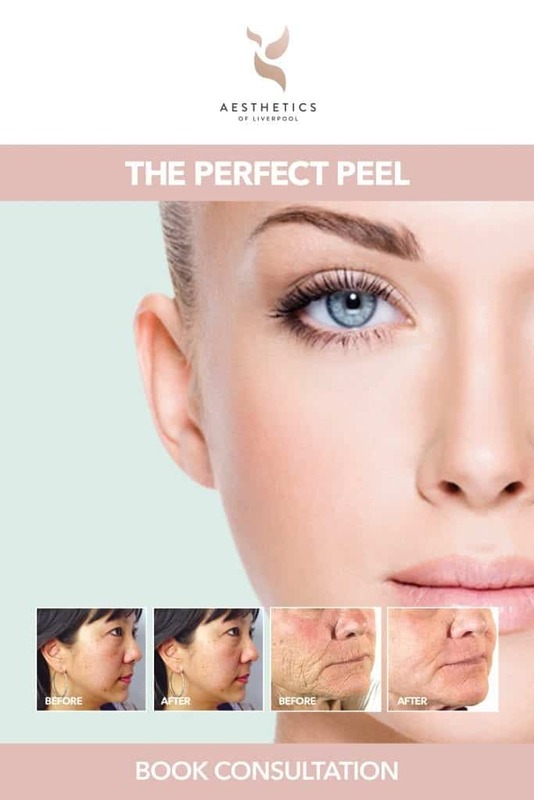 The risk of scarring is low as the lasers do not heat up the surrounding tissue to a great degree therefore the risk of scarring is considered to be very low. In rare cases scarring can occur, this is generally with those who have a history of scarring ,as well as poor healing at the treatment site through the patient picking blisters and scabs. Redness of the skin is common post treatment however this usually fades quite quickly. Post treatment Hyper Pigmentation or Hypo-Pigmentation (lightening or darkening of the skin) can occur though skin can return to normal after 6-12 months though in some cases this can be permanent.At Aesthetics of Liverpool we use very short pulse duration, this allows a high energy to shatter the ink but is only on the skin for a short amount of time, therefore there is generally no scarring or lasting damage to the skin. Is there any down-time following the treatment? Post treatment the Tattoo will look white or frosted, swelling, redness and blistering in the area are also common. The redness usually resembles sunburn and subsides with a few days, however it is imperative to wear sunscreen on a daily basis post treatment, and to the area clean and dry. The cost of Tattoo removal is completely depended on the size of the Tattoo, the colour and the number of sessions required. Prices range from £60 per session for a small area and up to £400 for larger areas. The full cost will be established in your initial consultation.